Vegan Gingerbread Cookies are pretty amazing on their own, but how about topped with this Vegan Royal Icing? 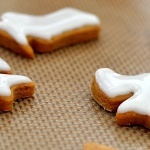 Yes, it is entirely possible to make a vegan royal icing that not only dries hard, but glossy! Insert ‘ooooh’s and aahhhs’ here 😉 And last but not least, later in the post I’ll also talk a little bit about vegan food coloring. So this is sort of a 3-in-1 post because quite frankly, I would love to say that I am all prepared for Christmas, shopping done, presents wrapped and waiting under the tree, but alas…this normally overly organized person is just not that prepared this year. Life happens, and it’s ok. It will all work out in the end. 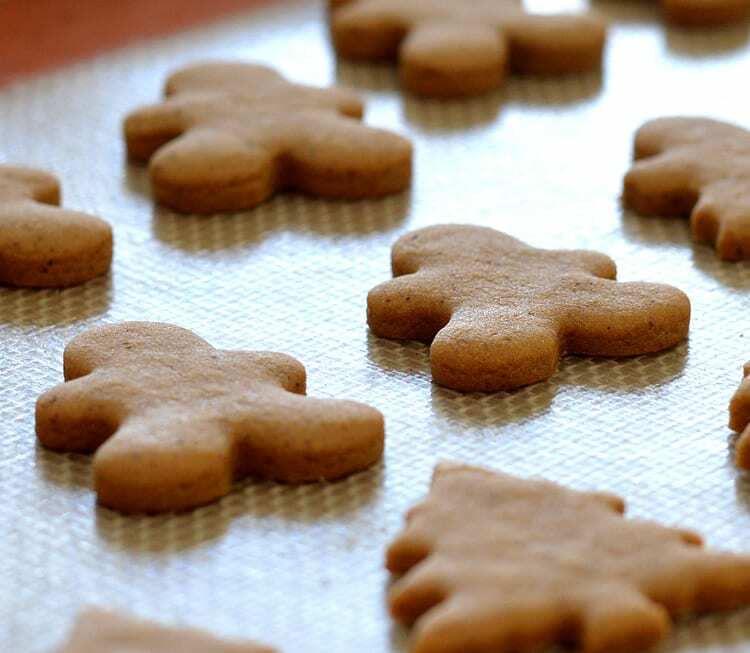 You will need vegan margarine, brown sugar, molasses, all purpose flour, salt and baking powder. We’ll spice them up with cinnamon, ginger, cloves. There is one specialty ingredient. I used Ener-G Egg Replacer (which is my current favorite). It is a plant-based, vegan mixture of starches and leavening agents. 1-1/2 teaspoons of Ener-G plus 2 Tablespoons of water are the equivalent to 1 egg. I have had the most consistent results in baking using this product. Not affiliated in any way, it just works. I do like to chill the dough (wrapped in plastic wrap) for several hours or over night, as it is much easier to work with that way. I choose a variety of small Christmas themed cutters. Snowflakes, snowmen, mittens, trees, stockings, bows and ice skates. Got it off of Amazon as well. Are you surprised? 😉 I know, I know…I am slightly addicted to the convenience of Amazon, but I love that I can provide you all with a resource where you can obtain these things as well. They bake for just about 5-6 minutes and are transferred to a rack to cool completely. Now onto the icing. Just 3 simple ingredients include: confectioner’s (powdered) sugar, light corn syrup (I like this one because it is certified vegan, but most syrups are technically vegan) and almond milk. That’s it! This is a ‘flood consistency’ icing meaning it is able to be piped and retain its shape, but will ‘heal’ or settle back into itself creating the smooth surface you see here. Consistency is key here. On the left should be what you get from my base recipe. Icing is very dependent on humidity, so you may need more (or less) liquid than I do here in Arizona. On the right is an example of an icing that is too thin and it will run right off of your cookie. It is easier to add than to take away, so start by adding 1/2 tsp at a time to the thicker mixture until you get an icing that when it falls back on itself, leaves a trail but eventually levels out. I picked up a simple piping bag, round tip and coupler for a few dollars. Everything is washable and reusable, but you can also find disposable bags. 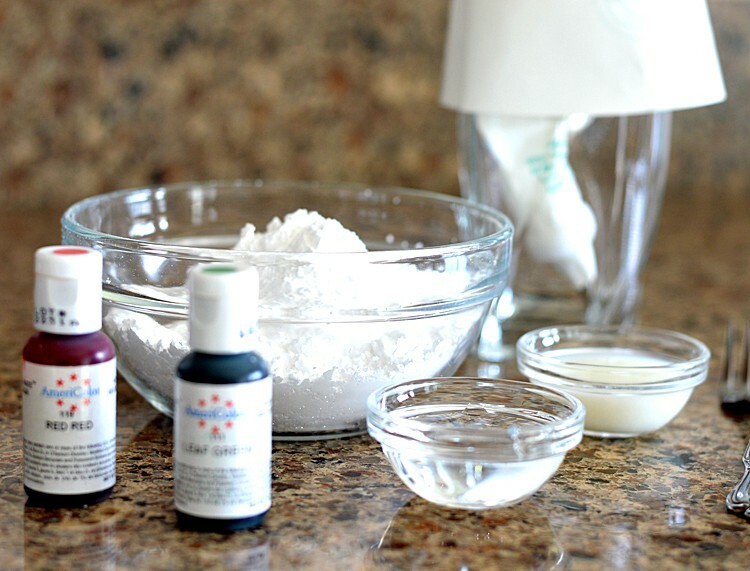 Another option, and a question I get quite often, is about food coloring. Vegan food coloring to be more precise. Although there are companies producing natural vegan colors, they are not true colors and appear very pastel and dull. Most of my readers have been less than impressed with those. If you are able to find it, there is one called ‘Xmas Red’ that I absolutely love for the holidays. I chose to do most of mine in white, but can you see how shiny they are? 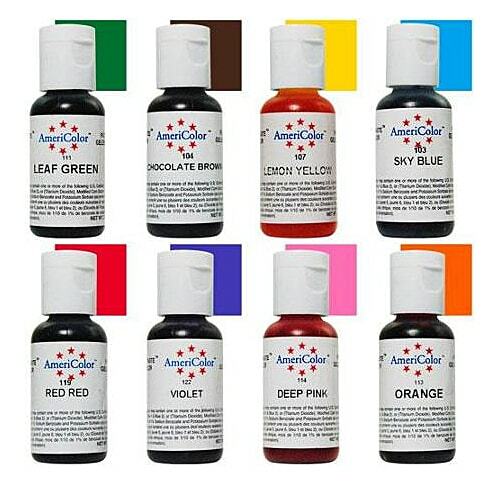 You could also use edible food color markers once they have hardened. Sprinkles, nonpareils, the possibilities are endless. Have fun. Get creative. One little helpful hint, keep a paper towel with warm water nearby to wipe the piping tip occasionally as this icing dries quickly. You’ll want to keep the tip clean and the icing flowing freely. Allow to dry completely. Another tip, keep a toothpick to help pop any little air bubbles that may occur. 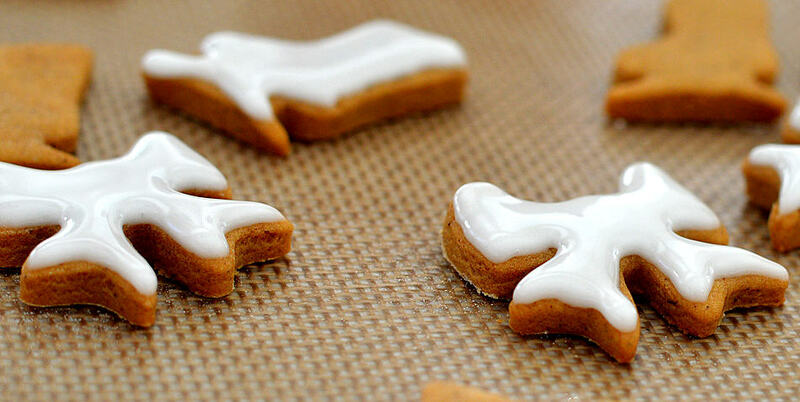 Do this before the icing starts to set. I’ll be bringing you a lovely buttercream style frosting in a few weeks, so stay tuned for that! Combine the vegan margarine and brown sugar in the bowl of an electric mixer until creamed. Split the dough in half and wrap in plastic wrap. Flatten into rounds. This will help them chill more quickly and evenly. 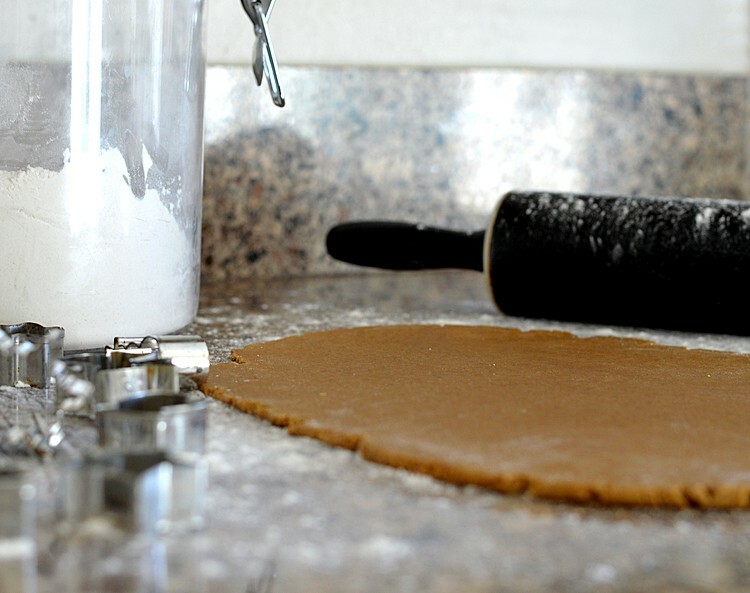 On a floured surface, roll the dough to about 1/4" thick and cut out your shapes. 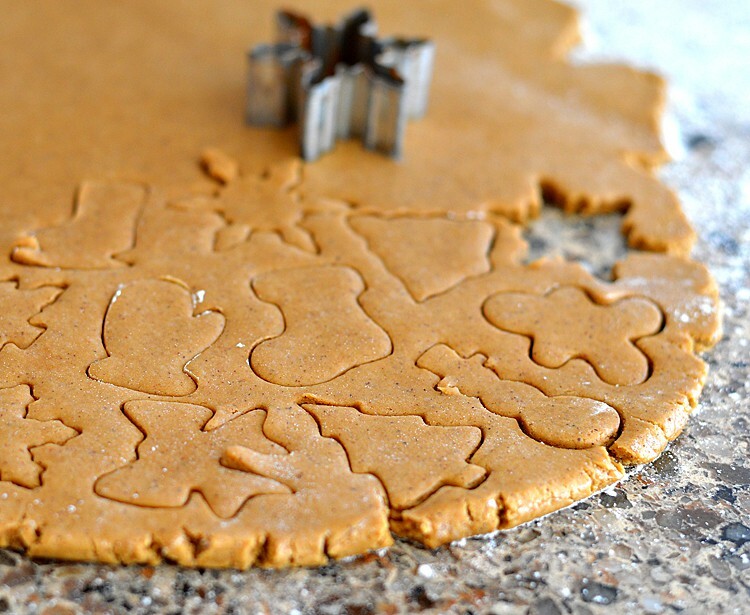 On a parchment or Silpat lined sheet pan, place the shapes and bake for approximately 5-6 minutes. This will depend on how large your cutouts are. 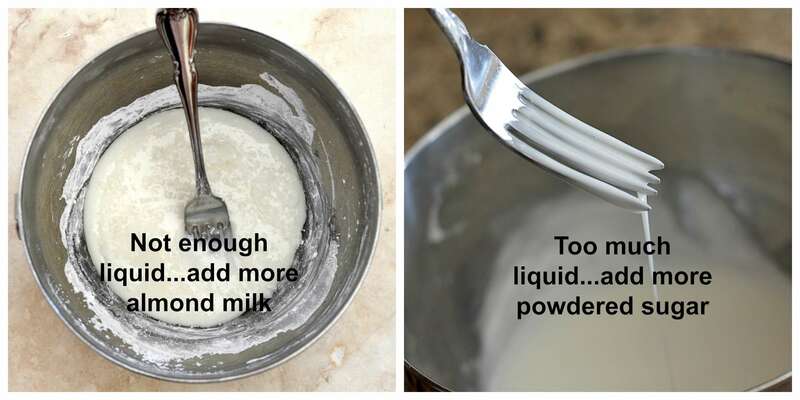 In a bowl, combine the powdered sugar, corn syrup and almond milk with a fork until smooth. If it is too thick, add more almond milk 1/2 tsp at a time. If it is too thin, add more confectioners sugar 1 tsp at a time. The icing should maintain its shape when drizzled but eventually 'heal' or settle back into itself. Test a cookie or two and wait a few minutes to see if it's too runny before proceeding. I use a small round tip to outline and then fill in the cookies. Tint the icing to make a variety of colors. The gel food coloring does not affect the consistency of the icing at all. Allow to air dry until hardened. At this point, you can choose to use edible food color markers if desired. Any chance you could come up with a sugar cookie version of this? We love to roll, cut and decorate sugar cookies for Christmas. I would love the gingerbread version, but the rest of my family prefers classic sugar cookies 🙂 Thank you so much! I think it’s funny it says to preheat and then chill for several hours or overnight. That’s a long time to warm the oven! One can only hope readers would realize the instructions got entered out of order and not preheat the oven overnight! It has since been edited. Thanks for letting me know.